Only Renewal by Andersen windows have the exclusive Fibrex® frame and sash material. 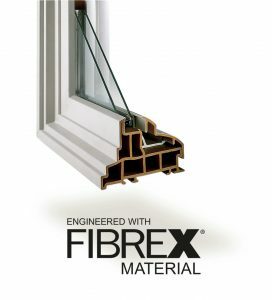 Fibrex gives you the strength, durability and insulating value of wood and the low maintenance of vinyl replacement windows. It comes with our exclusive limited warranty that ensures you that our windows last and look great for years to come. Fibrex is a blend of wood fiber and thermoplastic polymer. The color of the window frame is blended during the manufacturing process so the color stays true. Because it’s a combination of wood and plastic, it offers the benefit of both. It won’t decay or rot like wood and is twice as strong as vinyl. No matter the weather, it seals weathertight. It’s better than aluminum windows because it blocks thermal transfer nearly 700 times better so your heating and cooling bills are lower with windows made with Fibrex. Sustainability – A significant percentage of the wood used in the manufacturing process is reclaimed from Andersen Corporation’s wood window manufacturing facilities. Some of the thermoplastic is also reclaimed. This combination makes it an extremely sustainable product. Energy Efficiency – Fibrex is as insulative as wood but it creates a weathertight seal that significantly reduces energy leaks. It has very little thermal transfer so even in the sun, the window frame is never extremely hot and in winter never freezing cold. Low Maintenance – Fibrex material never needs painting so you won’t spend your weekends in the hot sun scraping and sanding your windows. Lasting Beauty – Because the of the unique manufacturing process, the color is injected during the manufacturing so your color stays truer longer. Not only does the color resist fading but Fibrex doesn’t pit, rot, crack or corrode making for a window that lasts and looks better longer. When you want a window that looks great, lasts and has little maintenance required, you want replacement windows from Renewal by Andersen with frames and sashes made of Fibrex. 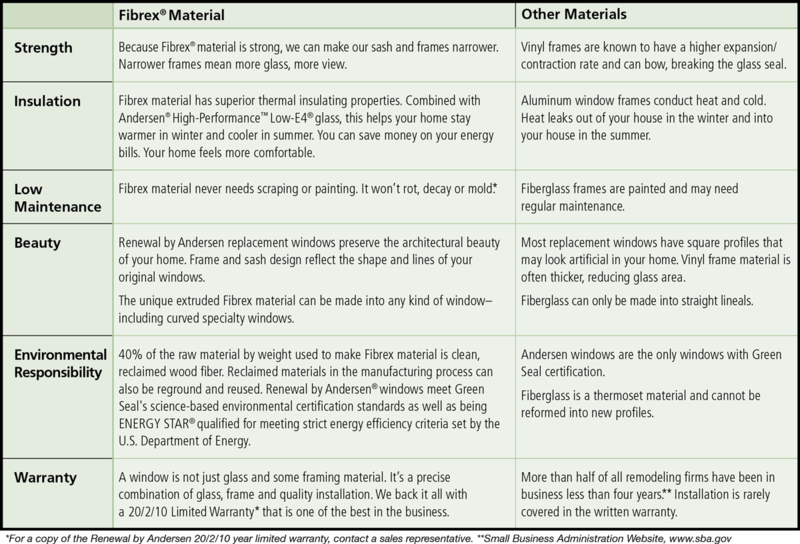 Our team members would be happy to share with you more about Fibrex frames and sashes for your new windows. If you’re interested in seeing the Fibrex material and learning more, simply fill out our contact form or call (615) 283-9463. Our in-home consultations are free.